Finally, the dog days of August have come to an end here in Seattle! The weather was so hot and dry for so long that many of my clems simply shut down. Now that the temperatures have moderated and nearly two inches of rain have fallen in the last week, many of my struggling clematis are beginning to show new growth. 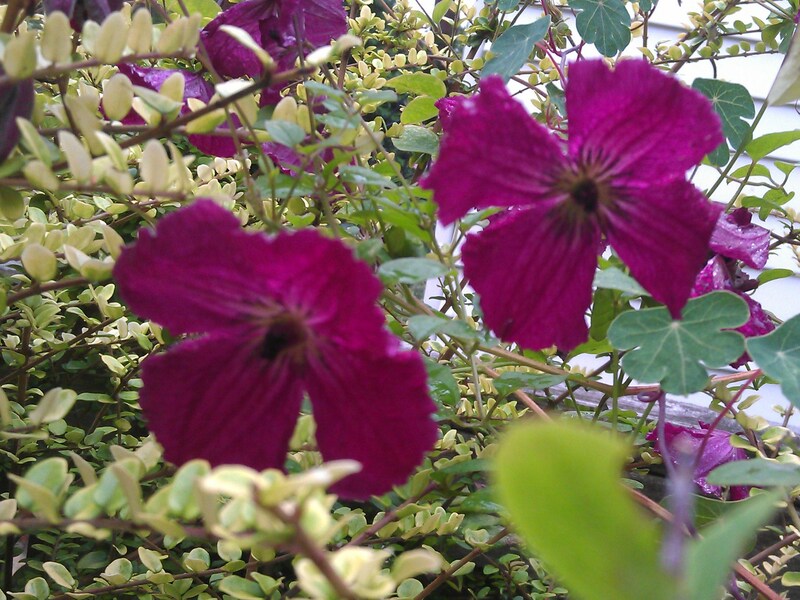 In spite of our difficult weather, though, a few of clematis stood out in August. 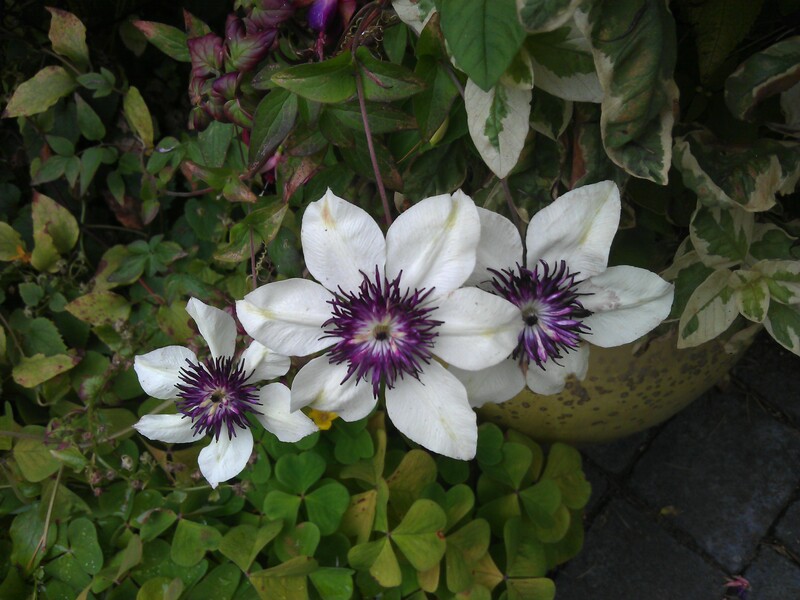 The hands-down winner in my garden during the month of August was Clematis viorna, a species clematis from the southeastern US that I purchased from Brushwood Nursery a few years ago. This plant, which has been blooming since early July, was not phased in the least by the hot dry weather. Every year, it blooms and blooms until hard frost (usually about mid-November for me). Soon the purple berries of the beauty berry (Calicarpa) it grows on will be in full color, making quite a show with Clematis viorna – I will be sure to post a photo when this dynamic duo struts its stuff. The vine also climbs up into my paperbark maple (Acer griseum) where it’s too high for me to deadhead. But I do deadhead all that I can reach regularly, hopefully extending the bloom time. Another plus for this clematis is that hummingbirds love it! Last spring I purchased a second Clematis viorna from the Rogerson Clematis Collection in Lake Oswego, which I am told will have red blooms. Time will tell. 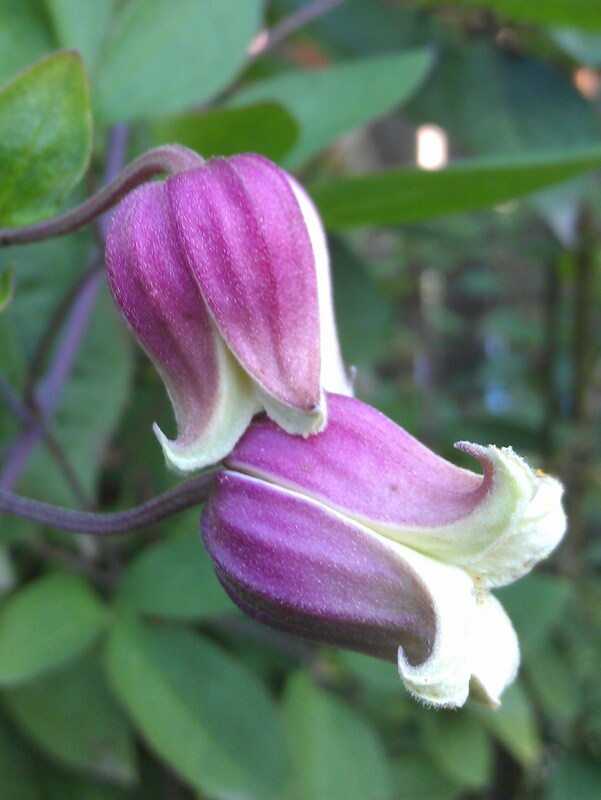 Clematis viorna, Blooming Since Early July! Several other clematis managed to show off in my garden during August in spite of the heat and drought. First up is Clematis Cassis. I bought this one last May at Joy Creek Nursery and planted it on my deck in a pot. It immediately took a fit and died back completely to the soil level – geez. Then, in early August, it sent up a single vine that magically sported stunning double flowers! 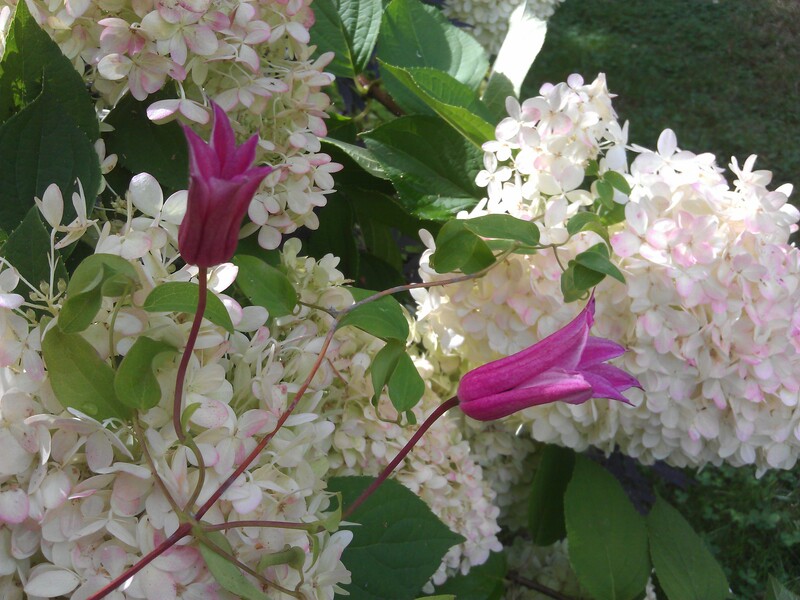 Madame Baron-Veillard is a useful clematis that doesn’t even think about blooming til late August or early September. 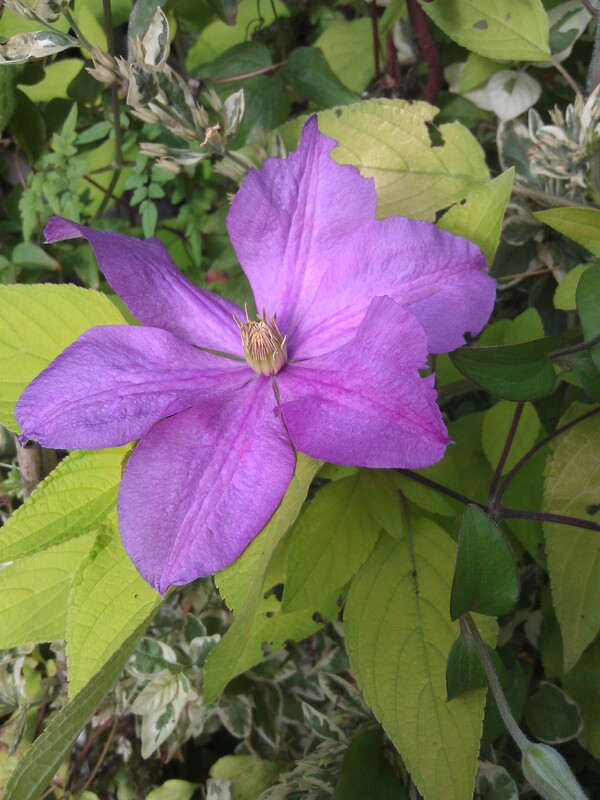 A fresh new clematis blooming this time of year is truly a treat. It’s mauve tones beautifully complement autumn perennials, like asters, colchicum, rudbekia, phlox, and many others, that are just beginning to burst into bloom. Another clematis that blooms late like this is Clematis Lady Betty Balfour, with deeper purple flowers – great if you can find one! This scrumptious clematis just keeps on going! It bloomed continually in my garden for six or seven weeks in July and August. Everyone who came into the garden ooohed and aaaahed over this one! 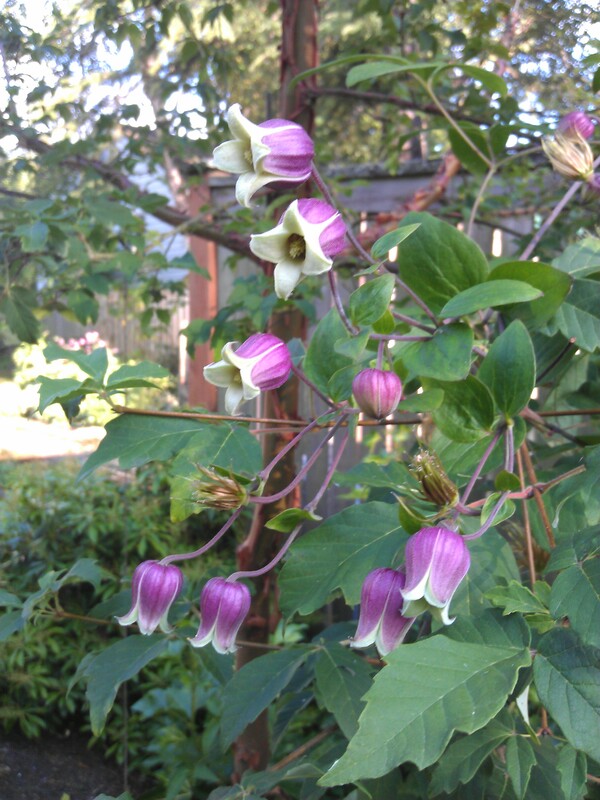 Clematis Kermisina is a late-blooming viticella type, flowering for me primarily in August. Each carmine red tepal has a touch of white at the base, which sets off the black boss beautifully. 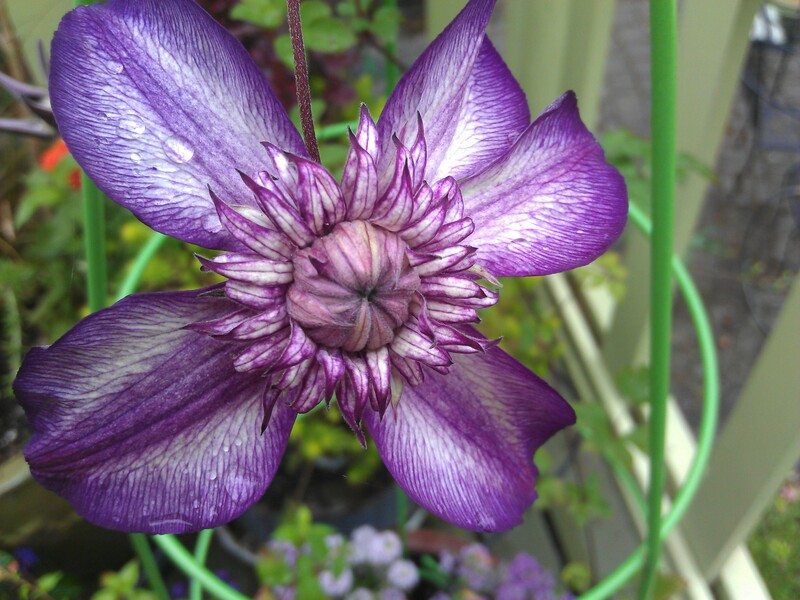 An easy care clematis I wouldn’t want to do without. 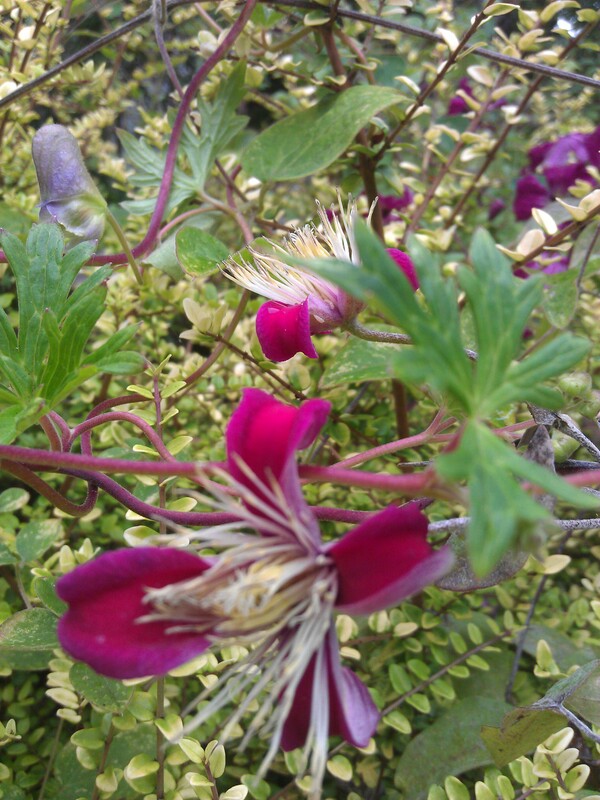 Of course, any garden with a clematis texensis hybrid in it will likely have blooms in August. These wonderful clematis, derived from a species clematis from Texas with small red flowers (Clematis texensis), make a bold late summer impact. One of the most beautiful is Clematis Princess Diana, but mine got swamped this year by my pushy sweet autumn clematis and didn’t bloom. And, of course, now we have the new one, white with a lavendar base, named Clematis Princess Kate. Though primarily available in Europe, I am lucky enough to have one, but mine is still too young to bloom. Below, though, are three others that were showing off in my August garden. This plant was hybridized in the late 1800s and has been grown in gardens ever since. I purchased mine as Clematis Etoile Rose, but recently realized that it was in fact Duchess of Albany. 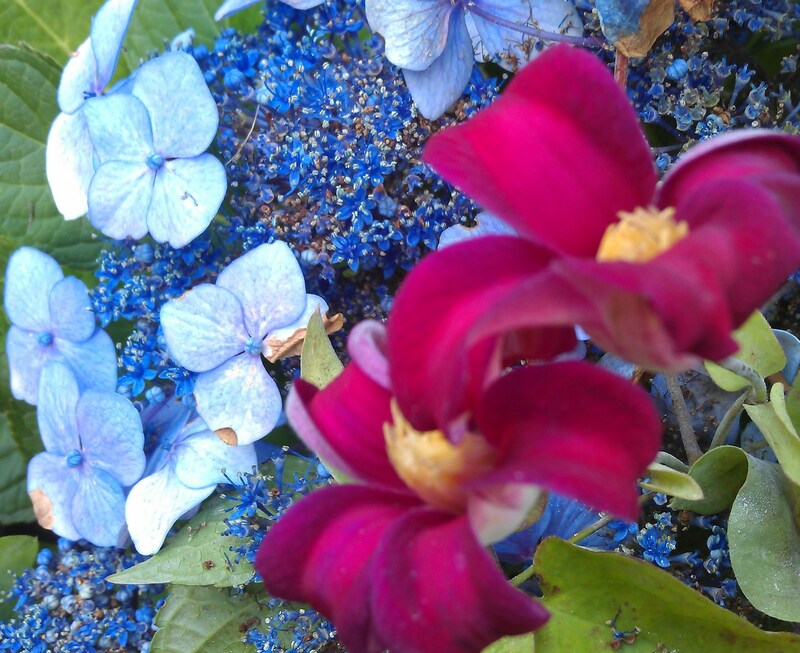 Lovely, nonetheless, especially cavorting in a hydrangea. Also growing in a hydrangea, Clematis Sir Trevor Lawrence, hybridized at the same time as Duchess of Albany, has a much darker pink color with purplish stripes (which unfortunately don’t show up well in this photo). The last of the August bloomers I’ll show you today is Clematis Lady Bird Johnson, another Clematis texensis hybrid. In spite of a tendency toward powdery mildew (along with a few other clematis with texensis in their backgrounds), its blossoms are gorgeous with really long stamens. We’ll see what September brings. One thing I know for sure is in store for me in September is a whole lot of clematis planting! Just yesterday I counted up the pots of clematis that have settled themselves in my potting area and came up with a daunting 23. Yikes! Where oh where will I plant them all? Hi Laura! First time to your blog, and I love the run down on what’s doing what. We share some favorites, especially loved your photo and comment about Lady Bird Johnson…..those stamens and the color of the sepals just rock! Hi, Deborah, Thanks for reading my blog! I, too, love Lady Bird Johnson, in spite of her proneness to powdery mildew. Hmmm, come to think of it, I haven’t met a clematis I DON’T like, at least not so far. hmmm we have a lot in common then, as i have not met any i do not like either! i think lbj outgrows that pm tendency, has less of that this year here.